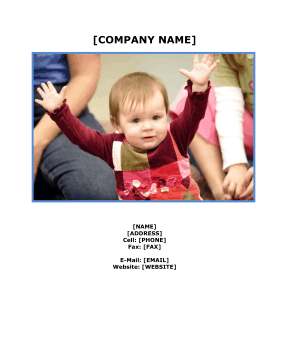 Meant for nurseries, daycares and child care centers, this free, printable business plan helps those in the recreation and education sectors plan out and market their companies. Elements of this plan will be helpful to anyone opening a preschool or indoor play place for kids. [COMPANY] is a sole proprietorship 100% owned by [NAME]. Currently, the Company operates out of [NAME]'s home. [COMPANY] has tentatively signed a lease for a building to house the operation at [ADDRESS], [CITY], [STATE]. [COMPANY] is a children's entertainment center offering a safe, clean stimulating entertainment and recreation for families with young physically active children, toddler -14 years. The main objective is to appeal to the cognitive, emotional, physical, special and social development of this population. The children entertainment industry is a rapidly growing industry. The focus on the well being of our children to participate in safe, clean exciting places becomes more important as the world around us becomes less stable. Parents look for places to entertain their youngsters that involve fun, active, social environments. 1. To build an image of the "Best" family entertainment center in southern [STATE]. The focus is to promote cognitive, emotional, physical, special and social development of children thru a fun, interactive, family and independent peer entertainment. 2. To aid in the well being of the next generation through entertaining activities. The children entertainment industry is a rapidly growing industry. The focus on the well being of our children to participate in safe, clean exciting places becomes more important as the world around us becomes less stable. Parents look for places to entertain their youngsters that involve fun, active, social environments. 3. To assist Parents - Evening events on Fridays and Saturdays would be geared toward children entertainment but would also allow for adults to gather and socialize while their children played independently. Our mission is to build an image of the "Best" family entertainment center in southern [STATE]. The focus is to promote cognitive, emotional, physical, special and social development of children thru a fun, interactive, family and independent peer entertainment. At [COMPANY] these activities have been packaged into a safe, clean, climate-controlled environment for children 14 and under to exercise and have fun while stimulating their imagination and challenging them physically. The indoor play park is based on the premise that if you set a large number of children inside a safe, yet challenging, imaginative soft playground area, they are going to have fun. They are also going to develop basic motor skills, muscle tone, self-confidence and social development through peer interaction. Furthermore, parents can enjoy close interaction with their children in a safe, secure, and stimulating environment. [COMPANY] is a place where everyone can play and have fun together; a missing link within in the family unit today. 1. Variety of entertainment and activities offered to keep children engaged. 2. Expanding activities and keeping up with market trends in children's entertainment. 3. Growth in size of our operations and offerings; keep our services fresh and new to keep children wanting to come back as they advance in age.